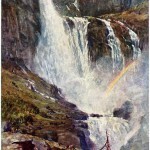 An ever growing collection of public domain landscape images. People or animals may appear in these illustrations but the focus is on the beauty of the land and sky. Winter is often depicted with dark, leafless trees standing tall over a snow-white landscape. These landscape drawings are beautiful and timeless. Verdant green landscapes, moonscapes and sailing off into the sunset are just some of the beautiful pictures you can find here on Reusable Art. 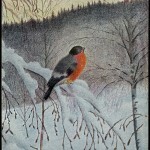 Beautiful full-color drawings of the Norwegian landscape. Beautiful pictures of fjords, waterfalls, and mountains.